Barrett Adventures Staff - Barrett Adventures the Real Jamaican Adventures. CAROLYN BARRETT will be happy to answer all of your questions and take your reservations via email, or telephone. It is best to use email, since I am often out on tours during the day. This photo was taken while on the deck of the MoBay Yacht Club, having a few minutes conversation with fellow members after a long day of sailing with some fun guests. LOXLEY WOOLARY is 'Mr. Personality' all the ladies, without exception, fall madly in love with him. A day with him is guaranteed to be fascinating. He will take time to show you everything tourists never learn about Jamaica except from us. He is charming, witty and endlessly interesting. More than two decades ago, Loxley started driving for and doing fishing tours for Barrett Adventures. They have become more and more popular over the years with those who want a real 'local' fishing experience. Take a look at FISHING ON THE NORTH COAST WITH LOXLEY for that adventure. 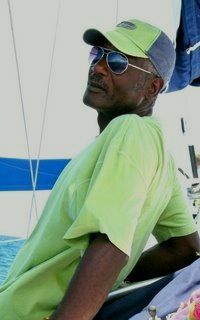 He is also the Captain on some of our sailing tours on THE LARK. He is a man who knows and respects the sea in all it's manifestations. Richard's newest interest is surfing. This was taken at Boston Bay recently when he took some guests there. He also likes working out at the gym, loves to swim, but doesn't like deep water boating and sailing, unlike his Dad and me. He has learned most of our more complicated tours and a good amount of the history of Jamaica. He is a fun guide to have for the day. PERCY OTTEY is our 29 seat Toyota Coaster Driver. He and I were in one of the very first Team Jamaica classes about 16+ years ago. There were 28 upset drivers who had to waste two weeks in the height of the season to sit through a class in how to deal with tourists. We all ended up teaching the teachers a lot about tourism. Percy, the other guys in the class and I bonded immediately. Since then, he has been most kind and reliable anytime we are short on vehicles for large groups. When he isn't driving for us, you can find him greeting people at the airport as they come out of Customs. DECON HAUGHTON is another mainstay of the business. He has a 16 seat bus and is full of little tidbits of information about Jamaica. Guests tell me he is extremely entertaining. Decon lives in Barrett Town. He and Loxley went to Mt. Zion School together as children. We all have a long history together.